Much has been written about income and wealthy inequality in the United States. 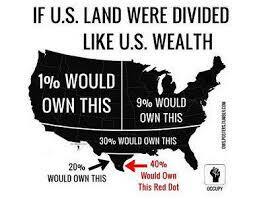 You probably know the round figures (illustrated in the graph above for 2007, but not much has changed in 7 years): 1% of the population owning 34% of the wealth and the next 9% owning 36%, for a total of 70% of the wealth held by 10% of Americans. The Bottom 50% of the population holds 2.7% of the wealth. 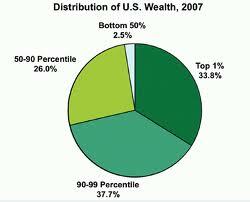 (perhaps the 9% who share roughly the same % of the wealth as “the 1%” – about 35% each—should be jealous!). We will be discussing the closing gap of income inequality between the U.S. and Brazil, the latter another very large economy with the reputation for even more inequality. Using the Gini index of inequality Brazil ranked 120th of 133 countries studied, but the U.S. was 80th. This gap has closed somewhat. Neither country is at all competitive with countries like Canada or most of the European countries. But wait—a contrarian question might be “so what”? Throughout history a very small percentage of the population owned vastly disproportionate shares of the material resources of society, particularly in the post hunter-gatherer populations, and dramatically so in most of the centuries since the rise of the first urban civilizations about 3000 to 2500 BCE. Between about 1895 and 1995, there was a gradual shift toward slightly more widespread dispersion of wealth throughout the industrializing world (mostly Europe and North America), but in the U.S. the trend has reversed in the past 20 years. A particularly striking statistic is the trend for “1%” followers is to look at their share of the national income over the last 70 years. 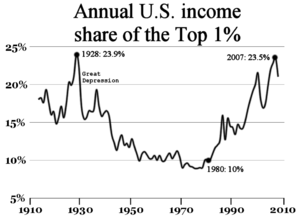 Between 1940 and 1980 this share fluctuated between 10 and 15% of INCOME (not wealth). Between 1980 and 2007 that share went from about 10% to 20%. Otherwise put, in 1980 income from wages, salaries, and investment yield increases for every $1000 of American income went from $10 for the top 1%– one out of every hundred Americans—to $20, an approximate doubling. Although it may be even more troubling in fairness and utilitarian terms that similar increases in income occurred for the top 10% of Americans, the focus of the left to center commentators (and Occupy Wall Streeters) was on the ONE PERCENT. That seems to be where the drama lies. Think again now: 1%+> 20% of income, 10% => 40% of income and the bottom 40% (2 lowest quintiles) shared 9% repeat 9% of the income of the country. This is a lot of numbers to absorb, and more detailed breakdowns and explanations and conclusions can be found in numerous sources. What we want to argue HERE is that yes, clearly there is a dramatic shift of wealth going on in the direction of a small group at the top. America in this sense MIGHT be said to not only becoming more like a typical Third World country, or like many societies throughout history going back through the Middles Ages to ancient times, but also that the U.S. is becoming dramatically less equal in income along several lines of measurement in the past 30 years and compared with the 60 years before that. Again we pose the question, “So what?” It may seem self-evident that this is not a good thing, that more equality is better, but this is not universally agreed upon. It will be good to hone in on the arguments (the very most important ones—and unusual) for both or several points of view on this!